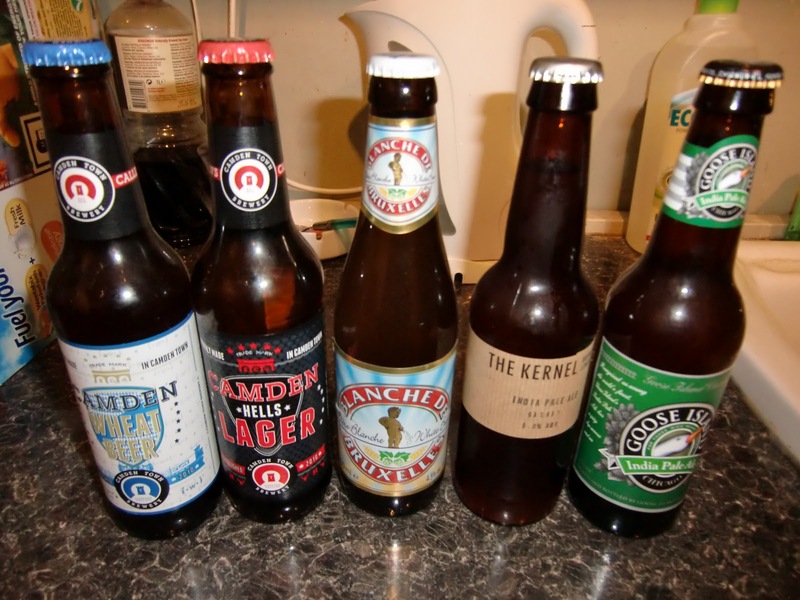 Beer appreciation (for want of a better word) is something relatively new to me. I have always drunk and enjoyed beer, but it's only been the last few months triggered by a couple of brewery trips that I've started to think more about it, and felt the urge to read/write and generally discover/taste more. Blanche De Bruxelles (4.5%) - Very yellow! Not much on the nose, but a nice thick head which was retained. Fruity, mild peachy flavour with floral notes. Not much of an aftertaste. This is one of my favourites from Belgium, although I'm glad the first time I ordered it (in Le Poechenellekelder, Brussels) I hadn't seen the label or I'm sure I would have dismissed it as a touristy gimmick. 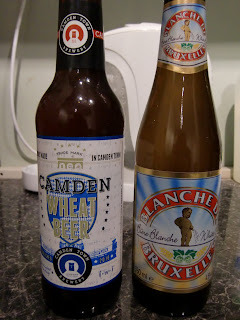 Camden Wheat Beer (5.0%) - A cloudy, muddy brown in colour, with no discernible head (was it the way I poured it?). A banana and spicy scent on the nose - Sam identified this as cloves, which I didn't pick up on. Relatively strong in flavour both on tasting and afterwards, with similar banana, caramel and spice notes. There was something slightly peppery in flavour which we couldn't pinpoint exactly. A nice level of carbonation and a strong sweet aftertaste. Camden Hells Lager (4.6%) - A vibrant pale gold in colour, with very little head (which disappeared fast), and a slight buttery toast smell. 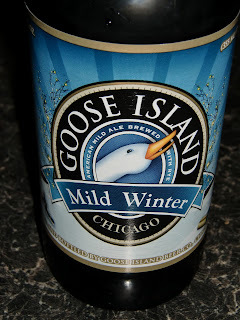 Quite carbonated, with an oily buttery flavour, and a slight peppery hoppiness. Sam informed me the buttery flavour is due to diacetyl (so I'll be looking that up later in the Oxford Companion to Beer which he got for xmas). I think we were both really disappointed with this one, as we'd found it a little on the bland side. 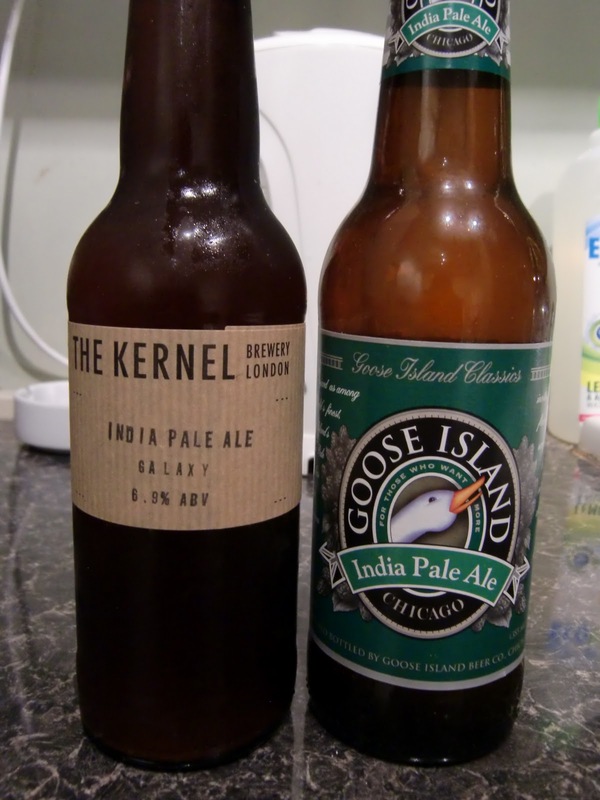 Kernel Galaxy IPA (6.9%) - A muddy, hazy brown/orange in colour, with a light carbonation. On the nose we got citrussy resinous hops, pine and Sam described it as a metallic smell. The taste was very similar - an intense hop taste - incredibly bitter, with a citrus pith aftertaste. I'll admit to not liking this one much, but then I never get on well with very strong (American) hop flavours which are the trend at the moment. 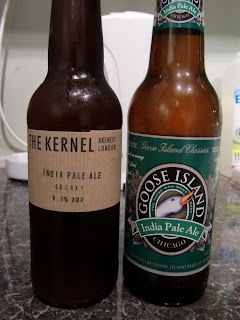 Sam loves Kernel beers, but whilst he liked this one, he felt it wasn't one of their best and didn't have enough malt/sweetness to balance out the flavour. Bonus Beer - Goose Island Mild Winter (5.6%) - Dark brown in colour, clear, with a thin head. On the nose we got caramel, Twiglets and burnt toast. The taste matched with a malty caramel flavour. Sam also tasted hazelnuts, but I couldn't get that at all. It was very drinkable (I was surprised how much I liked it), with a moderate carbonation, a well-rounded flavour and a malted aftertaste with slight hop bitterness. *Hazy due to a lovely couple of hours spent in the Rake - notable beer mentions go to Harviestoun Mr Sno'Balls, Thornbridge McConnells Stout, Stone Ruination IPA, Barbar Winter Bok and Redemption Big Chief.